Webkeeper's note The schvitz (Yiddish for "sweat") that the author describes in this tale of his visit 70 years ago is the Russian-Turkish bathhouse near East 116th north of Kinsman Avenue. It is still there, perhaps the last remnant of Jewish life in the Kinsman - Mount Pleasant area, once home to about 20 percent of Cleveland's Jews. Thanks to Dr. Seidman for sharing his tender recollection of a time past. 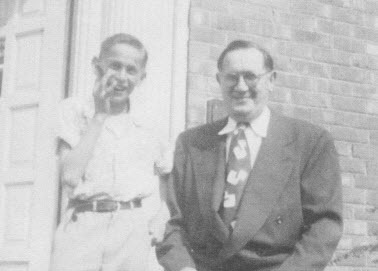 “Going to the Schvitz” with my dad, Phillip Seidman, in the 1940’s and 50’s was a rite of passage and a way to be close to him. My Dad and Mom, Fanny Seidman, founded Seidman Furniture, which for many years was at 1835 East 55th Street. In that store, we sold both new and used furniture. Dad was the buyer for used furniture. He found used furniture by following the classified ads in the Cleveland Plain Dealer. On Sunday morning he would get up early, study the classified listings in the paper, make telephone calls to homes that had listing of household goods, and go on “calls” to those homes to buy used furniture for the store. I would often join him. After a Sunday morning of making such calls, he and I, as my brothers had done before me, would go to the Mt. Pleasant Russian–Turkish bath at East 116th and Luke Avenue. In the story below, I have tried to capture what it was like for me to go to the “schvitz’ with my Dad. The story is part of a memoir, "So You Might Know" I wrote about my parents leaving the Ukraine in 1919, arriving in the United States in 1922, and making a living and a life in the United States. The author and his father Phil sharing a cigar. Taken in 1945, around the time of a schvitz visit. I wrote this section on the schvitz before I began writing this memoir in earnest. I thought for sure it would naturally fit into one of the chapters, but that turned out not to be the case. And yet, the schvitz was such an important pleasure for my dad and a rite of passage for me, and for several of you, dear readers, that it seemed important to include it somewhere, so I have placed it here, as one of the appendices. In the shtetl there was no indoor plumbing. On Friday afternoons, Jewish men went to the public bath to cleanse themselves for the Shabbos. In the new world, Dad and Mom had indoor plumbing, but the schvitz, the Mount Pleasant Russian-Turkish Baths at 116th and Kinsman in Cleveland, played a central role in Dad’s life nonetheless. Cleanliness may have been part of it, but I think more importantly it was a touch of the old world shtetl neighborhood. In later years, it became very popular for a wide range of men from different ethnic groups to go to the schvitz, but when Dad went it was a Jewish institution. Yiddish, or at least Yinglish, was the predominant language. The owners, the masseurs, and the patrons were all Jewish. When Dad went there, he felt at home. If Dad had made a couple of good buys on Sunday morning, and if he and Mom were not going visiting on Sunday afternoon, and if he had had a tiring week and maybe had “schlepped” a little too much furniture, he would want to go to the schvitz for a few hours. The Mount Pleasant Russian-Turkish Baths would give him time to relax, kibitz, take the steam, get a pletse (a whole-body scrub), a nap for an hour, and maybe, if the timing was right, have a steak smothered in garlic. It was his club, his Jewish Community Center of the time. It was something from the old country brought to the new country. My older brothers, Al and Lou, went with Dad to the schvitz. Sometime when I was about seven or eight years old, I got to join Lou and Dad, Al having left for college and the army. Sometimes I would go alone with Dad. It was Sunday around noon, after our house calls to buy used furniture. Dad drove to 116th and Kinsman, turned into the unmarked drive off of Luke Avenue, parked the car in the back lot, then got out. “Come on,” he said, and I scrambled out. He locked all the doors carefully and we headed for the nondescript building. He opened a heavy metal door, and we stepped into a dimly lit hall. A few feet in on the right was a counter, its ledge well-worn from the elbows that had rested on it over the years. In front of the counter was a window with a grill, something like they used to have in banks. There was a man behind the grill; his name was Yonkel. He would survey anyone coming in. Yonkel looked at my dad and said in Yiddish, “Fishel, where have you been? I haven’t seen you in a while. Nu, come in.” It seemed that he would say that whether my dad had been there just last week or a month ago. We went through another door, which opened to a large dormitory-like room where two rows of cots with cotton mattresses stretched out before us. On the right-hand wall was a line of metal lockers. On the left was a room in which you could see maybe four or five Formica tables with chairs around them. A group of men was sitting at one of the tables. They were wrapped in white sheets, playing poker, talking loudly, maybe cracking a joke in Yiddish or arguing about whose bet it was. As Dad and I walked into the large room, someone said, “Who’s this you got with you, Fishel?” “My boy,” Dad said, and I swelled with pride. Then the man half-smiled and said to me, “Are you going to get a pletse?” And my dad said, “Sure, he's going to go right up to the top.” I put on a brave face. On the right, at the near end of the lockers, was the small office in which Yonkel sat. That room had a desk and, on one of the walls, a series of hooks with numbers under them. Yonkel gave us each a large towel, a clean, pressed white sheet, and a wrist band with the key to our assigned locker. Dad nodded to Yonkel and said to me, “Come on.” We headed towards our lockers. I read the numbers of the lockers aloud until we found ours. We opened our lockers, turned our backs to each other, and undressed. Dad quickly wrapped himself in his big towel. I carried mine, because I would have had to wrap it around me twice to have it stay up. I put my clothes in the locker but didn’t know what to do with my key. The wrist band was too big for my slim wrist. Dad took my key bracelet and put it on his wrist. We walked down the center aisle of the room, where some men were sleeping, wrapped in their sheets, snoring. Other men were sitting on their cots, talking to each other in Yiddish. When we found two beds next to each other, we put our sheets on them so they would be ready for us when we came up from the steam room. As we were walking towards the steam room, showers, and cold pool, we saw the man who gave pletses taking a break from the heat of the steam room. He was sitting on one of the cots. As Dad passed by, he said, “Nu, Seidman, vilst a pletse?” (“Do you want a rubdown?”) Dad said, “Nu, vuden?” (“Of course I do”.) The pletse man said, “OK, I’ll be there in a few minutes.” I don’t remember the name of the man, but it was a Yiddish name and I will call him Shmuel. Towards the end of the row of cots was another door, which led to a large room made of concrete blocks. At the rear of the room was a small rectangular pool of cold, very chlorinated water. On the wall closest to the entrance were three shower heads. Across the room from the pool were two heavy wooden doors. One led to the dry-heat room, which Dad never used. The other led to the steam room. First, we stood under one of the shower heads and I slowly turned the water hot so I could prepare myself for the heat of the steam room. The door to the steam room was heavy. If I lingered in the shower and Dad walked into the steam room ahead of me, I had to pull the door open with two hands and all my strength. In the steam room were perhaps eight levels of wooden bleachers. The higher up you went, the hotter it became. At the far end of the room was the large open oven. In the oven were big rocks that had been heated, I was told later, originally by wood but then by gas boilers. There were naked men sitting at each of the levels. Some sat there with their elbows on their knees and their heads in their hands. Others kibitzed with men sitting nearby. Shmuel gave each of us a hat shaped like a loose-fitting bathing cap, but it was made out of felt. I stayed at the edge of the room, near the door, for a while. Then I sat on the lowest bench. There was a spigot out of which ran cold water. I almost continuously got up and filled my hat with cold water, carried it to my place, and poured the cold water over my head. I don’t remember Dad’s taking any time to acclimate to the heat. He put on the cap and climbed the rows to the top. He lay down on the highest bench, and maybe I am imaging it, but I think he said, “Ahhh, a machia.” (a pleasure) Shmuel, whose skin was wrinkled from the heat, followed him up with a big bucket of soapy water and a brush that was like a broom made of oak leaves but with a very short handle. A pletse was somewhere between a washing down and a scouring. It was given at the highest and hottest level of the steam room. The pletse man was respected for his ability to “take” the heat, and his patrons followed his directions. Shmuel told Dad to lie on his stomach. Dad rolled over. Shmuel washed him down with the oak brush. He constantly dipped it into the bucket of soapy water and cleaned every inch of Dad’s back side. Then, after maybe five minutes, he told Dad to turn over. Dad did so and Shmuel washed his front side. Through the whole process Dad was pretty quiet, but every once in a while he said, “Ah, gut.” I watched and listened from the bottom row and then tried to move up one level to get better adjusted to the heat. But I constantly went down to fill my felt hat with cold water, then slowly progressed back up the levels of wooden benches. Shmuel, after about five or six minutes on each side, slapped my father on the leg and said, “OK, gnug, that’s enough.” Dad slowly raised himself up. Shmuel offered to hold his arm as Dad climbed back down and headed for the door to the cold showers, but Dad, as always, walked by himself. Before Dad left the steam room, he turned to me and said, “Nu? Vilst a little pletse? Go up.” Shmuel beckoned to me. And so I made my way up the bleachers. “Here, lay down here,” Shmuel said. And I lay down on my stomach on the highest bench. Quickly Shmuel dipped his oak brush in the pail of water he had refreshed and covered me with suds and rubbed me with the oak-leaf brush. As long as he was putting water and soap on me I was all right, but in the intervening seconds when he withdrew the brush and dipped it back in the pail, my toes started to cringe from the heat. I turned to him and asked him to put some more water on me. “OK, OK,” he said, and brushed on more soapy water. I got some relief. Just like with Dad, Shmuel washed my back side, then told me to turn over. Meanwhile, I curled my toes as much as I could to keep my soft soles from burning. Shmuel showed me some compassion and completed his work in maybe five minutes total. "OK,” he said, "Come down,” and he took my arm and led me to the bottom. I opened the door quickly, went to the showers, and turned on the spigot as fast as I could, adjusting the water to something between lukewarm and cold to gain relief. After cooling down, I opened the heavy door that led back to the main room with the cots, dried myself with the big Turkish towel, wrapped myself in my sheet, and, holding up the ends so I would not trip, found Dad, who was already lying on his cot, drifting off to sleep. I got on the cot next to his but could not sleep. Typically, I would lie there waiting for Dad to wake up. I would listen to the various sounds of men schmoozing or playing cards. But the wait was worth it. When he woke up, Dad looked at me and said, “Vilst a steak?” I broke into a big grin. Dad got off the cot slowly, wrapped the sheet around himself and went into the kitchen. He ordered two steaks smothered in grilled garlic pieces, a schtikle of pickle, and two bottles of cherry pop. Not only was the steak delicious, but the conversation at the other tables in the room was fun to listen to. Some men argued while they played cards: "What do you mean, an inside straight beats three of a kind?" one said. "Oy, what do you know?" another one retorted. A third man chimed in, "Come on, play poker." The yelling got more intense and I thought a fight might break out. Yonkel came in and said, “OK, that’s enough, sha shtil, quiet down, people are sleeping upstairs." Other men were talking about business and doing deals. Dad said to someone sitting at the next table, “Nu, vus machts de?” (“What‘s new with you?”) They started talking about business, or shul gossip, or relatives, or people they knew in common. Many times I did not know what they were saying because my dad switched from Yinglish to all Yiddish, but I was occupied with my steak and pop and was content to just keep track of what I could understand. After eating the steak, sometimes Dad and I took a quick shower to wash our faces and hands. Then we went back up to our lockers, Dad gave me my key, and we got dressed. Back at the office, we put our sheets and towels into a big basket. Dad gave Yonkel our keys and told me to wait in the hall while he paid Yonkel for the entrance fee and the steak dinners. He left separate money for Shmuel, who was back in the steam room, giving someone else a pletse. Dad said goodbye, Yonkel said, “Zie gezunt,” and we walked out to the car in the dimming light of a winter Sunday afternoon. I was tired from the heat and fell asleep leaning on Dad’s side as he drove us home. When Ethan was born, we were not living in Cleveland, but we would visit our families there two or three times a year. Sometimes on those visits, when Ethan was about seven or eight, I began taking him with me and Dad or others to the schvitz, and at least once after Dad died in 1989, Al, Lou, Michael, Ken, Jeff, Ethan, and I all went together. I had the pleasure, with my brothers, of being together with our sons, enjoying the schvitz. Now there’s a machia. Irving Seidman, known as Earl Seidman for much of his time in Cleveland, was born in 1937. In 1943 his family moved from near East 105th Street in the Glenville neighborhood to the Fernway School area of Shaker Heights. He graduated from Oberlin College, earned an M.A. in Teaching at Harvard, and after teaching in Concord Massachusetts returned to Cleveland and taught at Shaker Heights High School. 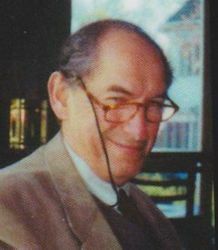 In 1964 he and his wife Linda Levenson moved to California where he earned his Ph.D. in Education at Stanford. Dr. Seidman is retired after 40 years in teaching and administration in the School of Education of the University of Massachusetts. Irv and Linda Seidman live near Amherst Massachusetts.